The Idaho Department of Fish and Game has conducted an assessment and evaluation regarding the health of the Big Wood River following massive runoff earlier this month from Beaver Creek Fire burn areas and preliminarily determined that the fishery has not been significantly affected. “It’s unfortunate that the event occurred, but right now we don’t consider it an emergency,” Doug Megargle, Fish and Game regional fisheries manager, said last week. Nonetheless, Megargle said the long-term effects of the runoff—which dumped ash, sediment and debris into the river from heavy rainstorms—are not known at this time. Megargle investigated reports of “fish kills” in the Warm Springs Creek drainage area earlier this month but said he found no evidence to suggest that the fishery was significantly impacted. “I haven’t been able to confirm any dead bodies,” he said. Megargle also tested water conditions, including dissolved oxygen and temperature. The Big Wood River and western tributaries in the Beaver Creek Fire burn area have shown high turbidity following heavy rains but Megargle said trout are typically able to survive those conditions. He said runoff into the river, such as what occurred, is typical after a major wildfire but that significant adverse effects do not usually occur. “Obviously, it’s a very conspicuous event, but generally fish are able to survive events like this,” he said. A photograph provided to the Idaho Mountain Express by the Wood River Land Trust and published with a story about a Land Trust and Trout Unlimited Big Wood Home River Initiative showed a dead rainbow trout just downriver from the confluence of Warm Springs Creek and the Big Wood River. However, experts have agreed there is no evidence to confirm that the fish died as a result of the runoff. It’s not uncommon for fishermen to find dead fish along the banks of a stream, but ascertaining the cause of death is usually difficult without a thorough analysis. Megargle said that during a massive runoff event that there are sometimes “mechanical fatalities,” explaining that sometimes fish die from being struck by debris, such as rocks or logs that are washed into a stream. “A lot of ash, a lot of sediment and a lot of debris flowed into the Big Wood,” he said. 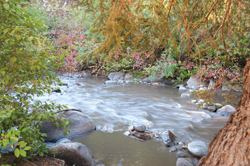 Megargle noted that runoff from a fire burn area is sometimes nature’s way of restoring or replenishing a stream. The runoff can bring new minerals to a waterway and provide new gravel needed for fish spawning. New debris, particularly boulders, can alter stream flow and create new eddies where fish can rest without expending much energy.